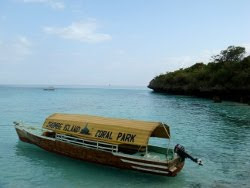 We were dropped off at Mbweni Ruins Hotel to meet the boat taking us to Chumbe Island Coral Park. This was the part of the trip I was *really* looking forward to. And honestly, Chumbe was completely amazing. Although I doubt I would stay there for more than 3 nights (we did 2 nights and I didn't feel like I'd missed out on anything). Chumbe Island is a Conservation island to the South West of Stone Town and has a Marine Reserve running down the Western side, which is where we went snorkelling on Wednesday afternoon and again on Thursday morning. The corals are unbelievable! And we had an amazing turtle experience (not sure if we saw Hawksbill or Green turtles tho?) where it was probably only about a metre below us and let us float above it for a good 10 minutes before slowly swimming off letting us follow it further along the reef for a while. I also had an amazing Bluespotted Ribbontail Stingray experience, watching two swimming along and then burying themselves. We also saw quite a few large Blackspotted Pufferfish. The other thing I couldn't believe at Chumbe were the crabs! I've never in my life seen so many, and most especially they had heaps of hermit crabs which are my absolute favourite! I saw quite a variety of crabs after we first arrived on Wednesday morning and I took a low-tide stroll to the two small islands off the south-western most tip of Chumbe. I also sat watching the hermit crabs scurrying about outside our bungalow on Thursday morning, I counted 32 at one time! We were also lucky enough to see the absolutely huge Coconut crabs on Thursday evening ... but I'm glad I didn't bump into one alone in the dark (they're nocturnal)! 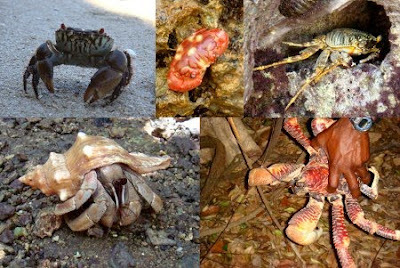 I know the bottom two pictures are of a Juvenile Coconut crab (where they still live like Hermit crabs) and an Adult Coconut crab, but I have no idea what the others are ... any ideas would be appreciated! 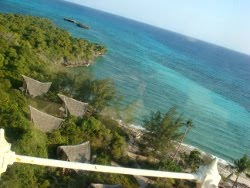 We also climbed the 132 steps to the top of the lighthouse on Chumbe Island (still functional!) and enjoyed the view :) In the photo on the right, you can see how the water comes in at high tide, at low tide you can walk all the way to the two islands. I also swam out to that sand bank at high tide. Swimming at low tide was pretty much impossible, but at high tide it was divine! We even saw a baby Blacktip Reef Shark chasing fish in the breakers! We also did one of their Nature Walks and saw the Mangrove Pool full at high tide (quite amazing!). We finished our stay off with a private candlelit dinner on the beach on Thursday evening. So happy to hear you had a wonderful time. Where are the bigger versions of your pictures?